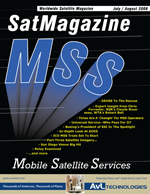 Mobile Satellite Services (MSS) are a crucial component of the satcom industry. The main difference between MSS and a cell system ismobility! MSS has proven its efficacy for providing communication services across the globe, especially in servicing those areas that have poor or few communication options, including developing countries and the vast oceans of Earth. For me, two of the most important standards to live by are honor and integrity. This has also served me well in business practices. However, as we all know, it is not uncommon to encounter and endure less savory entities during our journeys. The grim statistics become more precise daily. The massive (7.9 on the Richter scale) earthquake that staggered the Sichuan province on May 12th has affected millions of Chinese. The numbers are staggering, with more than 60,000 dead, more than 26,000 still missing, with 353,290 known injured, and as many as five million left homeless. In Myanmar, where Cyclone Nargis struck a month ago, 130,000 are dead or missing, and two million are homeless. and such brought to mind Boeing Satellite Systems International, Inc.. Fortunately for SatMagazine and our readers, the President of Boeing Satellite Systems International, Inc. Stephen T. ONeill, was available for an interview. Mick focuses on solutions in the Broadcast Media and Cellular Backhaul marketplaces. We recently spoke with Mick regarding iDirects announcement regarding their intelligent platform having been tested and certified to be fully interoperable with Ericssons Abis over IP GSM satellite backhaul solution. An extremely valuable accomplishment! For this issue, Chris journeys to Japan to receive an update on Ultra HDTV, which some suggest is the absolute Holy Grail for the satellite TV industry. When Bob Dylan sang the lyrics that comprise this articles title back in 1964, he prophesized a future where the slow one now, will later be fast, a maxim in a different context today that could apply to the MSS industry. There are plans by almost all MSS operators to go faster and have more content delivered over their satellites at broadband speeds. If you live in the USA, you probably know about the surcharges that appear on your personal or business phone bill for the Universal Service Fund. This fund subsidizes phone services in rural and other locations where it is difficult to offer a profitable service at an affordable price. But did you know that your company should be reporting to the FCC about compliance, and may be obligated to collect fees and pay them to the Fund? First responders around the United States are already dealing with the beginnings of a busy and difficult season of managing natural disasters. With new offices on the 19th floor in the Sunning Plaza in Hong Kong, as of April of this year, AsiaSats AsiaSat-2 satellite targets customers in Asia and Australasia, the Middle East, and Europe. Offering multilingual and multicultural broadcast services, the satellite packs 24 C- and 9 (linearized) Ku-band transponders. The Geostationary Operational Environmental Satellites (GOES), operated by the National Oceanographic and Atmospheric Administration (NOAA), continuously track evolution of weather over almost a hemisphere. GOES primary functions are to support weather forecasting, severe storm tracking, and meteorological research. Feature: MSS Goes Live In The S-Band, Or..., "Meet Me In St. Louis"
Americans love movies, like that Judy Garland classic of hopes and expectations in an exciting new era. The MSS industry is evolving in much the same way, and is on the cusp of delivering groundbreaking mobility services to meet Americans love for mobility and connectivity. In January of 2008, the Federal Communications Commission (FCC) conducted an auction of 62 MHz of spectrum that was to become available upon the switch from analog to digital signal transmission by TV broadcasters. The changeover occurs in February of 2009. Of the 62 MHz, 20 MHz was apportioned in two, 10 MHz blocks. Thanks for returning for Part III of the satellite imagery article. Lets take a look at what, and who, is taking a look... in Part II, we present ImageSat International. The Relay program [1&#8211;9] was undertaken by NASA to perform active satellite communications and to measure Van Allen belt radiation and its effect on satellite electronics. In December 2006, the purchase of Telesat Canada by Loral Space and Communications and PSP Investments was announced. At this time, Loral Skynet, the satellite services subsidiary of Loral Space and Communications, was operating ten satellites. A three-in-one conference must be similar to drinking a double espresso and a Red Bull, combined. Talk about getting many things accomplished in a little amount of time! Very smart. From the beginning, the VSAT industry recognized that VSAT installers would require training to transform a pile of cables, electronics, and antenna parts into a revenue-making VSAT terminal. Up until now, most VSAT installer training programs have focused on how to bolt up the components and mount parts to a roof or wall.